When you bite into a locally-grown, organic tomato in the middle of July, you taste the difference. There’s a depth of flavor that you can only find in the fresh fruits and veggies available at your nearest farmers market in the Roaring Fork Valley and beyond. In addition to flavorful, hyperlocal produce, farmers markets are the place to buy grass-fed beef and organic eggs; freshly-baked breads and pastries; handmade wares from Colorado artisans; jams, honey, pasta, and wine; and much more. Here’s information on farmers markets happening in the Roaring Fork Valley and beyond in summer 2016. 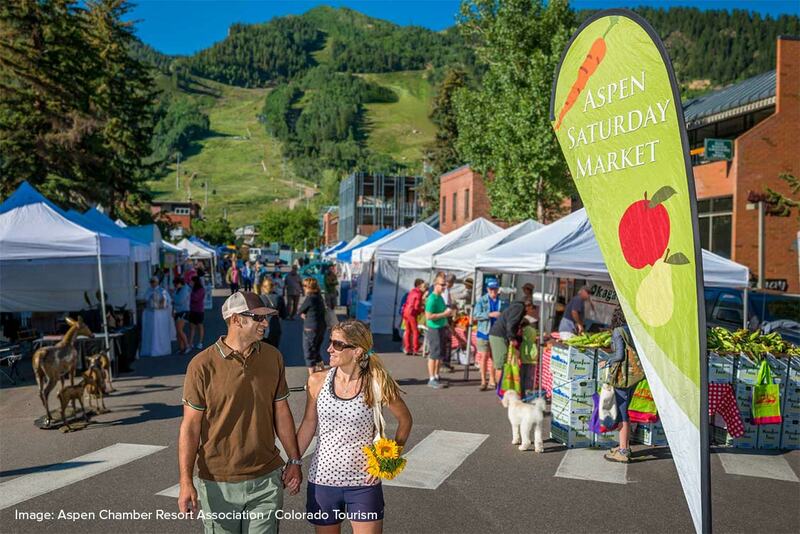 Visit the Aspen Saturday Market from 8AM – 3PM on Saturdays in downtown Aspen. The Aspen farmers market forms a u-shape on Hopkins, Hunter, and Hyman. Highlights include fresh flower arrangements from Zephyros Farm, cheese from Avalanche Cheese Company, and colorful summer squash from Borden Farms. The Basalt Sunday Market is held downtown on Midland Spur. At the market, buy produce and meat from Rock Bottom Ranch; sip locally-roasted coffee from Rock Canyon Coffee; and let the kids enjoy fun arts and crafts. Visit each Sunday from 10AM – 2PM. Carbondale has two farmers markets—a daytime market and an evening market. Visit the Carbondale Farmers Markets, held each Wednesday on 4th Street, and shop locally-grown produce, listen to live music, and check out handmade jewelry. The daytime farmers market is from 10AM – 3PM, and the Carbondale Evening Farmers Market runs from 4-8PM. Visit the farmers market in Glenwood Springs on Tuesdays from 4-8PM. Highlights of the Glenwood Market include live music, a macaroni and cheese contest, and freshly-baked bread and pastries. Visit the New Castle Community Market on Thursdays from 4:30-7:30PM at Burning Mountain Park. Market highlights include handmade soap, wood and glass art, jewelry, essential oils, and local produce. Visit the Rifle Farmers Market on Thursdays from 4-8PM. Grab a cup of fresh squeezed lemonade, and then, shop local fruit and veggies, baked goods, jams, honey, pasta, and handmade goods. When you’re a resident of the Roaring Fork Valley and beyond, you get to bite into the freshest of Colorado peaches and crisp lettuces; listen to talented local musicians; and shop for beautifully handmade hats, clothes, jewelry, and artwork by local artisans and artists. Visit one of these farmers markets this summer, and delight in the best of Colorado! If you would like to learn more about what it’s like to live in the Roaring Fork Valley, contact Lynn and the team at Amore Realty. Call 970-379-4766, or fill out our contact form.